What if there was a way to adjust your work setups in controlled increments of a few thousandths of a inch? And what if this technology would cost next to nothing? Consider the underappreciated shim. 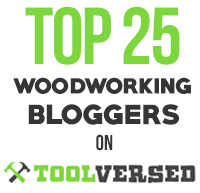 There has been a proliferation of adjusting gadgetry in the woodworking market over the past decade or so. Rip fences, miter gauges, router lifts, thickness planers, and so forth, can be souped up with micrometer adjusters and digital readouts that seem to promise precision in the end product. These devices might add convenience and accuracy to woodworking but only if they are used thoughtfully. The craftsman must be cognizant of the different levels of accuracy required for various tasks and, just as important, of the consequences of inaccuracy on each side of a target. If used mindlessly, these gadgets can easily make a woodworker lose sight of the logic of the construction process. I usually prefer simpler, more intuitive methods that often involve using shims. For example, if a groove cut on the router table needs to be bit wider, a strip of tape applied to the edge of the workpiece or the fence will widen the groove on a second pass by .004″. When I made the fence for the router table, despite doing “everything right,” it required a piece of .002″ plastic shim at each end to make it straight against the Starrett, and some blue tape on the bottom to make it square to the table. It’s just as good as if it came out perfect on the first try. This is not cheating! This is “microadjusting”. Shims can also be used to “measure” intentional gaps, such as in fitting a door or drawer. 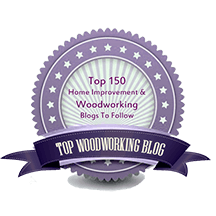 Wood shims are non-marring and can be made to whatever thicknesses you want, which allows you to make and confirm these small measurements according to your artful eye’s desire. So maybe you made the hinge mortise a bit too deep; you know what to do. 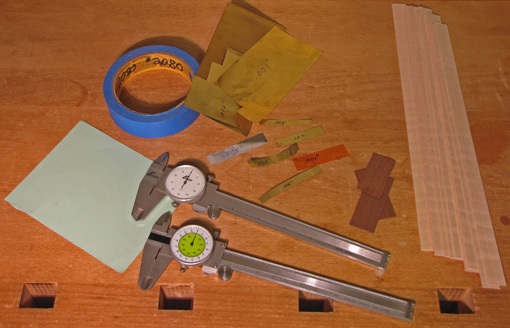 Sure, we try to be accurate but we work in the real world and it helps to have a Plan B.
I keep on hand in the shop all sorts of shims, including brass sheets, a book of plastic shim stock, a leaf gauge set, blue tape, paper, and, of course, slices of wood. When, by chance, some good candidates for shims come off the table saw or bandsaw, I toss them in my box o’ blocks. Sometimes I take out dial calipers and measure and mark them. Remember: it’s OK, it’s microadjusting. You know how it is. You are committed to a project, sweating the details, maybe doubting some design features, maybe doubting the entire aesthetic or structural concept of the project, and wondering whether anyone will ever care about the joint you are fitting or the curve you are shaping. You may wonder if you will later care, or even remember, about a design decision or construction detail that now seems so vexing. Last week I had the privilege and pleasure to display my work at the Paradise City Arts Festival in Northampton, Massachusetts, a high quality juried show with 260 booths in a variety of craft media including glass, ceramics, jewelry, painting, fiber, wood, and furniture. The three-day show was very well attended, attracting lots of folks with a well-nurtured appreciation of fine craft. Yes, people notice; they get it. 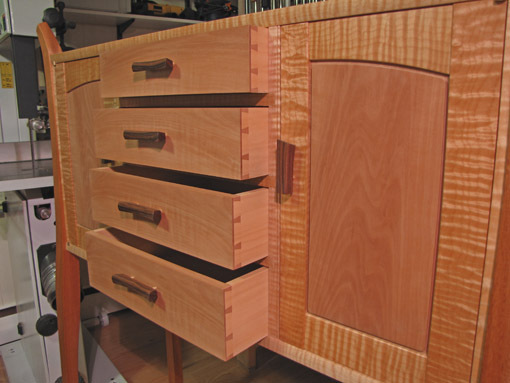 It was exciting to see people running their hands along a curved table leg, inspecting exposed joinery, asking about matching figures in the wood, feeling the gentle action of drawers and door catches, taking in subtle design elements, and so forth. The pieces on which I had lavished mental and physical efforts were now able to stand on their own, to just be what they are with no required annotation or message while people discovered them. In this way, these objects support a meeting of aesthetic minds between maker and appreciator which is gratifying for both. It is worth staying with it on that project because you and others will share that quiet joy. That is a path to happy woodworking. This coming Columbus Day holiday weekend I will be exhibiting my work at the Paradise City Arts Festival show in Northampton, MA. This is a high quality, juried show in which I am proud and excited to participate. There will be fine crafts in many media including wood, glass, fiber, ceramics, photography, and painting. Northampton is in western Massachusetts. If you are in the area, the show is a great way to get some craft inspiration as well as run up the balance on your credit card. There will be a ton of beautiful work at this show. 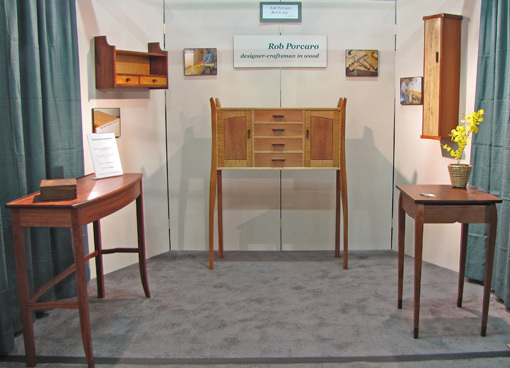 Readers, I invite you to stop by booth #632 and we can talk woodworking. 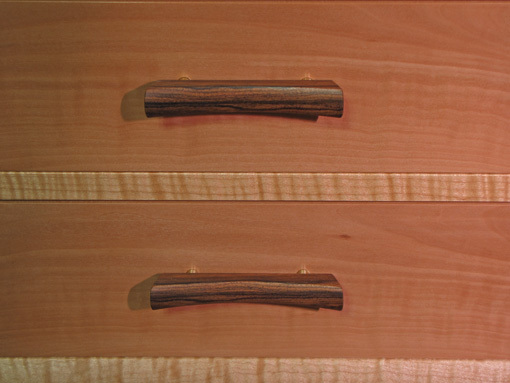 Making a drawer handle is a fun opportunity for creativity, but it ought not make a dissociated statement of its own. The handle should be consistent with the design of the whole piece while providing an interesting accent. I like a pull that is inviting to gently grab, yet is sturdy. For contemporary work with graduated-size drawers, commensurately graduated handle sizes may be a nice touch. I usually choose dark, dense, exotic woods for handles. try to be at ease in your work. 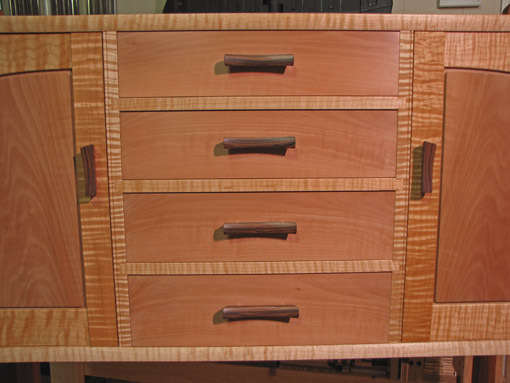 Believe me, these drawers are not perfect; no one’s are! I do, however, try to work at a level where I can enjoy the process and the product, and forgive little imperfections. I wish you enjoyment and success in your woodworking.